The primary tool for measuring volatility is the CBOE Volatility Index (VIX) currently trading around $14-16. Movements in the VIX are largely related to market reactions and track the market's expectation of 30-day volatility. The index's value is based on a weighted blend of prices for a range of option contracts on companies in the S&P 500. Therefore, you can think of the VIX as a barometer of investor sentiment and market expectations, tracking fear and greed in real-time. On May 16, 2008 the VIX traded at $16.47 and during the financial crisis the index peaked at $79.13 on October 28, 2008, a 380% increase. On the flip side the S&P 500 fell 37.3% during that same time period. Through observation we can conclude the two indexes have a highly negative correlation, thus they are inversely related to each other. 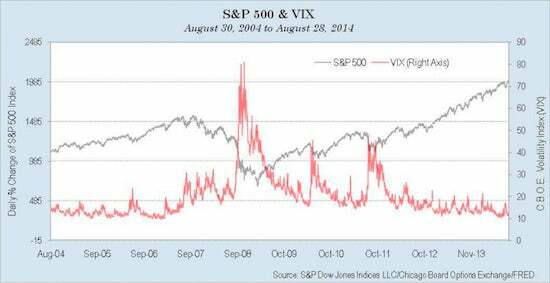 Simply put when the S&P goes up the VIX goes down, and vice versa. However, the inverse correlation is not perfect, as there is always going to be a base level of implied volatility priced into the underlying options. The question many individual investors ponder after making this observation is: "How can I make money on stock market volatility or bear markets?" Typically, self-directed investors turn to inverse exchange-traded funds (ETF) in attempt to profit from volatility or declining markets. Such an ETF can be an attractive investment vehicle for many reasons, but they are most popular for their liquidity, and are widely sold by online brokers as commission-free. The VXX is the most known ETF associated with tracking volatility, and one to avoid. The misperception is that VXX tracks VIX, however, in reality the product tracks derivatives based on the price of VIX which do not accurately replicate its performance. The simple answer is through put or call options. The solution works two ways: use put options to hedge your portfolio from declines or write covered calls to generate income. Using options rather than inverse or alternative ETFs allows you to risk less capital and protect winning investments. Trading options also provides you with a more cost-effective way to capitalize on spikes in volatility. Of course, all this depends on your own individual circumstances and objectives, investors should note that volatility is an inherent part of investing, and during times of heightened uncertainty volatility usually goes up. How correlated is my portfolio to the S&P 500? What is the beta of my portfolio? Can we use options to protect winning investments? Investment advisory services offered through Dynamic Wealth Solutions LLC, a registered investment adviser. This page is published for residents of the United States and is for informational purposes only. Investment Advisor Representatives may only conduct business with residents of the states and jurisdictions in which they are properly registered. Therefore, a response to a request for information may be delayed until appropriate registration is obtained or exemption from registration is determined. Not all of services referenced on this site are available in every state and through every advisor listed. Dynamic Wealth Solutions, LLC does not offer legal or tax advice. Please consult the appropriate professional regarding your individual circumstance.